I'm just now getting over the post holiday shock. It's not that my life during the holidays is so hectic, but rather it was all of the last minute knitted holiday gifts I felt I just had to make that has caused my left eye to have a permanent twitch. As luck would have it I failed to take pictures of the items I lovingly knit for people. I say lovingly because after a few martinis everything seems wonderful as you knit. My most memorable piece was the knitted coin purse I made for one of my closest friends. I was knitting the thing until 2:30 in the morning the night before we were going to exchange gifts. Honoring the true spirit of the season, I made her promise before opening my gift, that her gift was equally worthy since I had put a lot of sweat equity into making it. Yep, we're still friends. After 15 years she's quite used to my quirky sense of humor. Since the end of the holidays I have made my first ever hat using the dreaded double pointed needles. It was a helmet liner project for the troops. Mine was turquoise. Interesting color choice I know, but details were never my forte. I also made myself a mini coin type purse, finished a pink scarf that has been on the needles forever and am continually knitting squares for afghans. The newest project sponsored by The Recycles Lamb(now on Ravelry!) is for Family Tree which is a non profit organization helping women and children escaping domestic violence. The plan is to have 10 afghans completed by Easter. Ackkk! On a more technical note, I have finally broken down and joined Facebook. I needed one more distraction in my day I suppose. Happily a lot of my knitting friends are on it and now I actually know their first and last names! I am also trying to wean myself off of AOL and save myself a bit of money each month. I don't really need it as a web browser. My new kitten Merlin is a frustrated knitter. The little guy will grab the entire ball of yarn (needles and all) and make a run for it. So much for leaving stash around the house. Speaking of stash, mine has been slowing increasing. It's mostly the Red Heart yarn that I have been using to make my squares and cat blankets for the shelters. Because of the price and variety of color, Red Heart is a great choice for charity knitting. This week I got a retro looking skein of theirs called "Cherry Chip". It's reds and browns. Really fun. If you notice that I don't post a lot on this blog you are correct. I do most of my postings on myspace under sashastearoom. This too may change in the near year as I am becoming quite the wild and crazy computer girl. 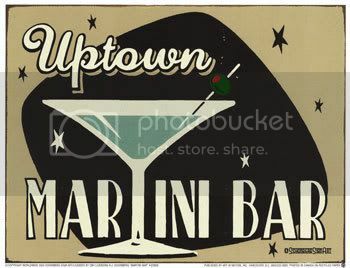 Wow, is it time for a martini yet?